Not all corn is created equal! 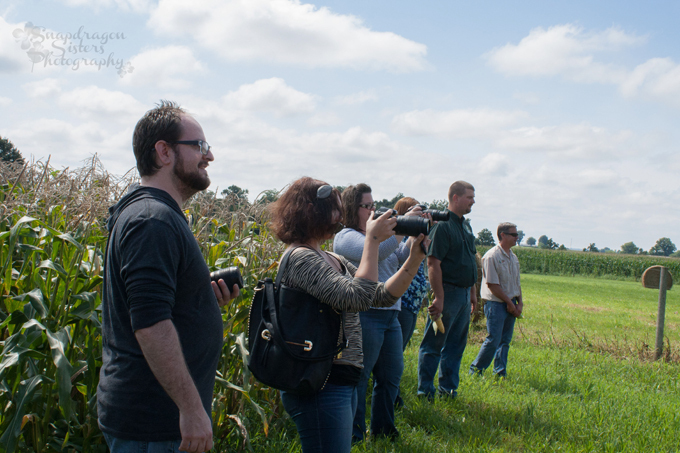 We recently invited bloggers to visit our farm to see how we raise sweet corn and beef cows. 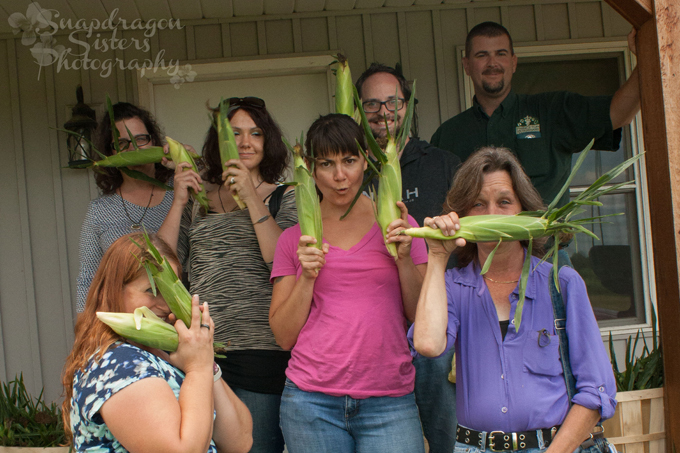 Farmer Doc and I were thrilled to have a small group of bloggers come out to our farm. 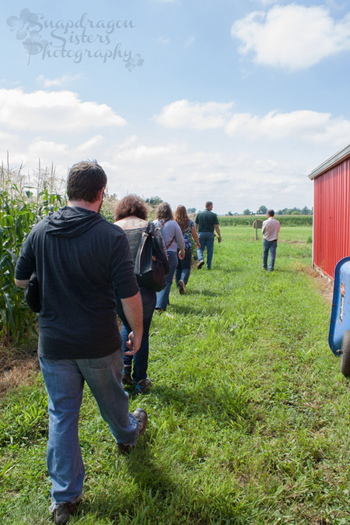 Hil’Lesha from To the Motherhood and Brooke from Creative Country Mom visited our farm to check out our cows, and to see how we grew sweet corn this year. Even though it was hot (imagine that – hot in August in Indiana! ), we had a great time. Our main goal was to talk about the sweet corn. But the cows showed up and sort of stole the show. We did talk a lot about how we take care of our ladies and how we raise hay to feed them through the winter. Everyone had a chance to see all the equipment it takes to make hay – a mower-conditioner, a tedder, a rake, and a baler. And, of course, a few tractors to pull all the equipment! It takes a lot of time, planning, and equipment maintenance to make enough hay to feed these hungry cows! In fact, Farmer Doc is out baling hay as I write this! Then we got back to talking about the corn. Did you know that most of the corn you see growing is not sweet corn? 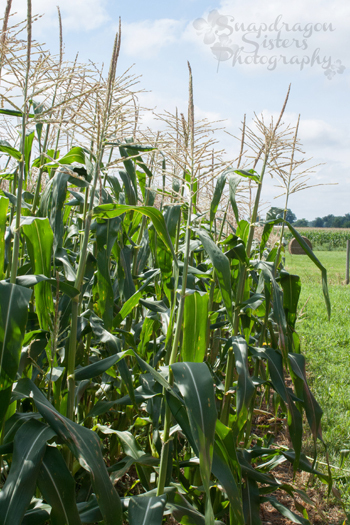 More than 99% of the corn grown in the United States is field corn – which is not quite the same as sweet corn. The big difference is the sugar content. Hopefully you’re not surprised to hear that sweet corn has more sugar than field corn. While sweet corn is great to eat straight off the cob, out of the freezer, or out of a can, field corn isn’t. Field corn can be ground into corn flour or corn meal and used in food; it can be used to feed animals; or it can be used to make ethanol. Each silk that you see sticking out of the end of the husk on an ear of corn is attached to one kernel. Pollen from the tassel on top of the corn plant falls (or is carried by the wind) down onto the silk. This pollinates that one individual kernel. Then the silk falls off the kernel, but stays inside the husk. If you find an ear of sweet corn with crooked rows or missing kernels, there was probably some kind of problem with pollination that year. Our corn had exceptional pollination! 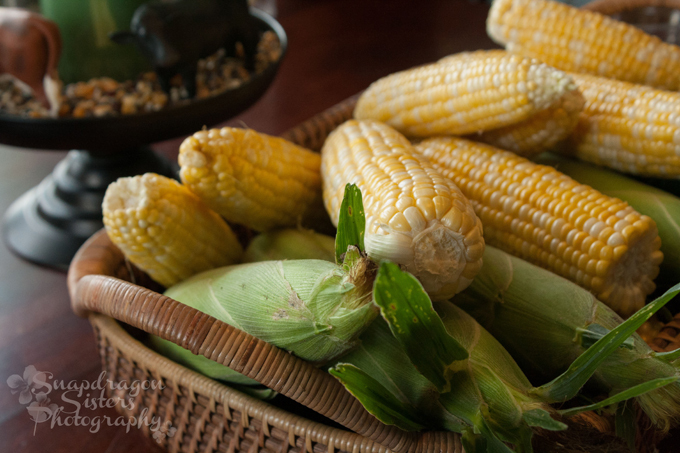 It made straight rows of big, plump kernels with plenty of moisture. Part of the reason our sweet corn turned out so well was that the weather cooperated with us. We missed most of the heavy winds and rains that other parts of Indiana saw. And our garden is on top of a hill, so it wasn’t affected by the flooding that some of the lower areas had. It also has a lot to do with the quality of the seed. 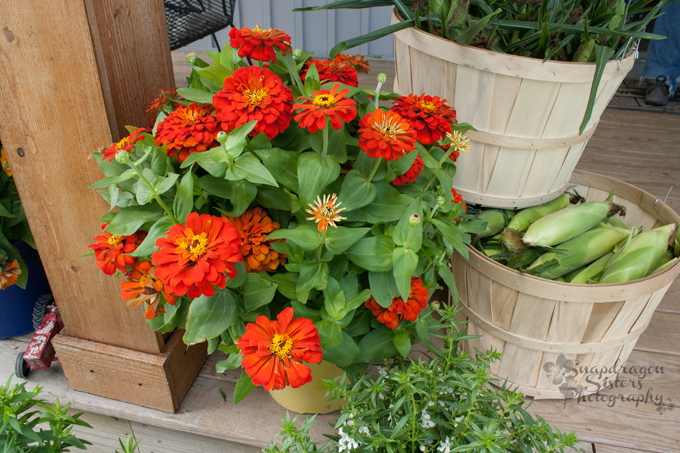 There can be differences in seed quality between the seeds that you can find in your local box store and seeds that you can find through a reputable company. Some of that difference may be just in the way the seeds have been stored, but some of the difference will be in the different varieties that are available. We did grow genetically modified (GM, or GMO) sweet corn. The main reason we chose GM sweet corn was for weed control. Our garden is constantly plagued by weeds. We had to heavily fertilize this plot with composted cow manure. 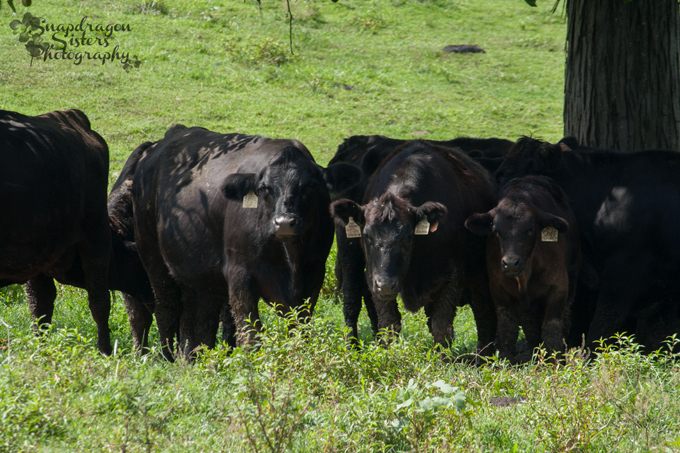 Composted cow manure is a fantastic fertilizer – and it grows some amazing weeds. Farmer Doc is always busy the first two weeks of July with the Gibson County Fair. The weeds tend to take over our garden while he’s busy with other things. This year, we lost our green beans, peas, cantaloupes, watermelons, and squash to the weeds. We were able to spray glyphosate (Roundup) on our sweet corn patch to kill the weeds, but not harm the corn plants. As corn grows, the leaves fill out and form a canopy between the rows. This canopy shades the ground below, so weeds don’t have the sunlight they need to grow. We sprayed our sweet corn two times for weeds – both times before the ears had started to form. And we watched the sweet corn thrive while the green beans were swallowed by weeds. 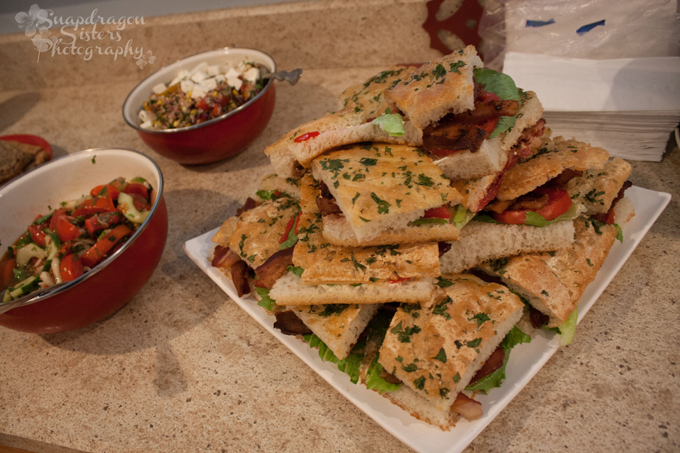 We wrapped up the day with a delicious lunch catered by my friend Sarah Wolfe. I have loved Sarah’s food ever since she opened her restaurant, The Farmer’s Daughter, in Princeton. I was heartbroken when she made the difficult decision to close! To my delight, she is opening another restaurant in Evansville in a few short weeks. We will definitely be making a few extra trips to Evansville to visit Sarah and eat at The Dapper Pig! This has been a wonderful summer for fresh produce. 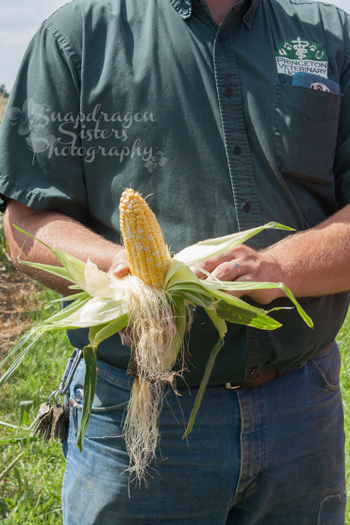 Farmer Doc, Baby Doc, and I have loved having so much delicious sweet corn right on our farm. We ate it twice a day sometimes, and we froze a lot to use through the winter. Now that sweet corn season is officially over we are feeding the corn stalks to our cows, and we have moved on to processing tomatoes in our kitchen! We all had a blast talking about cows and corn! 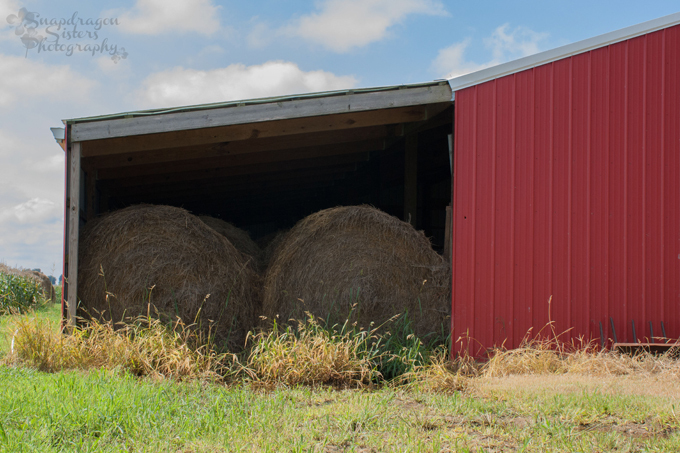 Check out Hil’Lesha’s post about the farm on To the Motherhood here. What’s the Difference Between Sweet Corn & Field Corn?